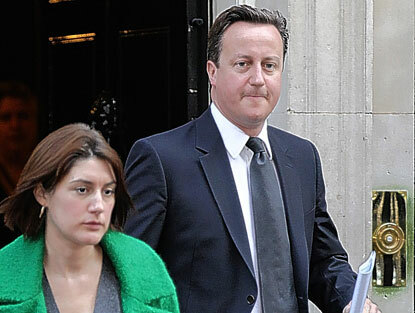 DAVID Cameron’s glamorous aide Gabby Bertin turned strike-buster today as she helped man Britain’s borders at Heathrow. Political hacks feared she had joined the walk-out by civil servants when she failed to take her usual seat in the Commons gallery for PM’s questions. But it later emerged his Press Secretary was among the army of volunteers checking passports and running immigration controls at the country’s top airport. Gabby Bertin with Mr Cameron. Dark-haired Gabby, 32, a popular figure in Westminster, would no doubt grant a welcoming smile to those arriving in the UK for the first time. But journalists can vouch she is also a tough cookie who would have no truck with anyone who steps out of line. During her single shift, she had cause to quiz one arriving passenger over her travel documents. Gabby Bertin – affectionately known as “Berters” in the lobby – joined Tory campaign HQ straight from university and has worked for Mr Cameron since his leadership campaign in 2005. She has worked for David Cameron since his leadership campaign in 2005 and has since been described as one of the most powerful women in Whitehall. Number 10 confirmed “a handful” of staff working directly for the PM were among 125,000 civil servants who joined the strike over pensions. Mr Cameron asked members of his policy unit to do their bit to keep Britain’s gateway open during the 24-hour stoppage. Later there were reports that Gabby had been spotted manning a passport control desk at Terminal One. She was given two days’ training in border security last week and learned how to check passports of passengers arriving on “low risk” flights. Mr Cameron told the Commons the signs were that contingency measures were minimising the impact of the strike and branded the action a “damp squib”. Passengers arriving told how they expected long queues but waltzed through the airport in minutes. It’s not clear how senior a role Gabby was given but she’s renowned for her calm efficiency. Downing Street said it was unlikely she would accept a shift payment even if she was offered it. Gabby’s used to working in the top-flight – and is definitely here for the long haul.